Inspired by the old TinaSitter project I made back during my Justus League days, I've been working on a window sitter framework, written in C#. Design and art by Kawa. I could've sworn she was thinner when she was first created. Design and art by HammerGuy. Design and art by Tyty. By popular request, she's back. Design by xKeeper and Hiryuu, art by Kawa and a bunch of others. For Cynthia only. Adds some costumes from TinaSitter. These used to be in the main pack, but have been split off to an add-on. For Cynthia only. Adds some nightwear. These used to be in the main pack, but have been split off to an add-on. Art by Kawa, Tyty, and HammerGuy. For Cynthia, Teyla and Hammy. Gives each girl one or more Christmas-themed costumes, and some bonus accessories. Design and implementation by Kawa. Allows a character to poll this site for updates and downloads them where available and allowed. Recommended. To install a plugin, simply drop the DLL file in the same directory you're running the main executable from. It'll enumerate, load and use all available plugins. Because of differing poses and such, add-ons can only work on those characters they are designed for. The "Voyager" add-on costume, for example, only works for the Cynthia character. Functionality plugins work for all characters. 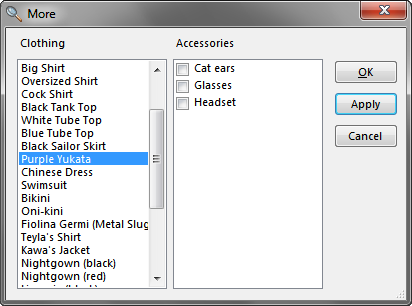 The More menu item appears when there are more than fifteen costumes and/or accessories available to prevent the menu list from growing too large. This feature allows you to change certain colors chosen by the artist. At the heart of the color remapping system is a simple bitmap resource containing two strips of 8 by 8 pixel color tiles. The top row contains the source colors and the bottom contains the default target colors. You may notice if you look into the resources that Cynthia's hair color is hot pink in the base image — this is made brown by default, as is made clear in the color map image.